American SSTO VTOVL orbital launch vehicle. 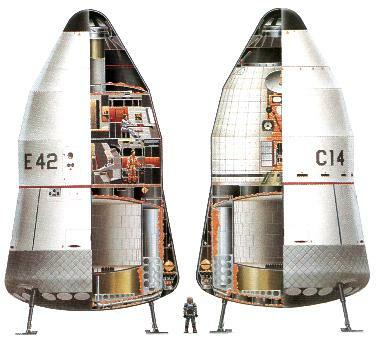 The larger 180 metric ton Phoenix design of the 1980's was envisioned in two versions -- the Phoenix C (Cargo, unmanned) and Phoenix E (Excursion -- for use as a lunar or Mars lander and personnel transport to earth orbit). 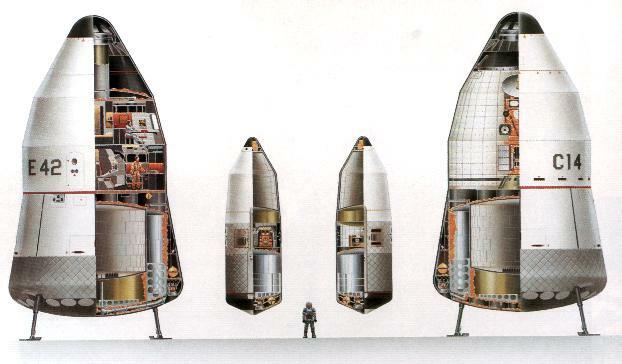 The earlier versions used liquid oxygen oxidizer and two fuels (hydrogen and propane) but later iterations used only oxygen and hydrogen (varying the oxidizer to fuel ration during ascent). The designs used an 'aeroplug' in place of the 'aerospike' of earlier SSTO designs. Gary Hudson and Maxwell Hunter spent several years trying to interest investors in the designs before the company folded. Status: Study 1982-1988. Thrust: 2,840.00 kN (638,450 lbf). Gross mass: 180,000 kg (390,000 lb). Height: 17.40 m (57.00 ft). Span: 9.80 m (32.10 ft). In 1982 Gary Hudson and his partners founded Pacific American Launch Systems to develop VTOL SSTOs for the commercial marketplace. The proposed Phoenix family included two large vehicles. The earlier designs used mixed-mode dual-fuel propulsion to achieve higher propellant mass fractions and a more compact vehicle. Twenty-four individual bell nozzle rocket engines were chosen to allow abort even if several engines failed. The use of smaller engines was also aimed at reducing the cost to develop the propulsion system. Both kerosene and propane were considered as the second fuel. Propane was finally chosen for density, cost, storage at close to the lox boiling point, and reduced engine development and maintenance problems since the coking caused by kerosene would be reduced. Later versions of the design were drastically different. Study showed that most of the gains of dual-fuel could be achieved by changing the mixture ratio of a lox-hydrogen rocket engine during ascent. Later designs also used water-cooling of the aluminum skin for thermal protection during reentry, in place of a passive heat shield. The individual engines were replaced with a new-concept 'aeroplug' engine. The aeroplug differed from earlier aerospike designs in that all but a few percent of the plug surface was removed, providing a smooth base for reentry. This meant a loss of performance that was more than compensated for by a lighter structure. The aeroplug used J-2S turbomachinery and could operate at 1200 psia combustion pressure and a vacuum area ratio of about 200:1. Steering would be by differential throttling. Phoenix L American SSTO VTOVL orbital launch vehicle. The small Phoenix design of the 1980's was envisioned in two versions -- the Phoenix L (Light, cargo only) and Phoenix LP (Light-Prime, crewed). The earlier versions used liquid oxygen oxidizer and two fuels (hydrogen and propane) but later iterations used only oxygen and hydrogen (varying the oxidizer to fuel ratio during ascent). The designs used an 'aeroplug' in place of the 'aerospike' of earlier SSTO designs. Phoenix M American SSTO VTOVL orbital launch vehicle. Intermediate versions of the Phoenix concept were sketched out in the mid-1980's. These more conservative vehicles used individual altitude-compensating bell nozzles rather than the aeroplug baseline. Composite materials were to be used in the aeroshell and, possibly, in the propellant tankage. Family: orbital launch vehicle, SSTO. Country: USA. Agency: Pacific American Launch Systems.